i’m really wondered how people in the middle class are going to bare such hikes, as people are getting more addicted with automotive like Bikes, mopeds etc etc. But still i’m not so clear with the statistics and some unanswered questions regarding the petroleum products ..
* Even after this abnormal hike in petroleum products, petrol is underpriced by Rs. 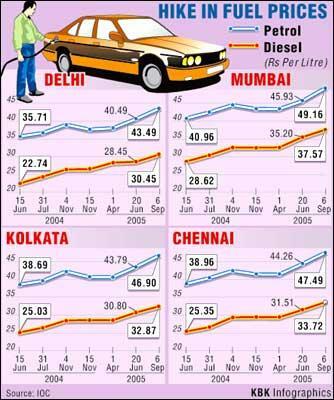 7.45 and diesel by around Rs.5 . 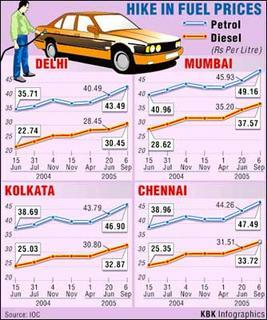 The case is so pathetic for LPG which is underpriced by Rs. 96 and kerosene by 10 rs .. So does i means people who ruled as early were not capable of financial dealings or the people now working in the centre are not good enough to control the conditions ???. If govt is able to give subsidiary at a high rate for such essential products even before two years, why not now ??. Whose real pblm is this ??? * Next one Petroleum companies like IOC, BPCL, HPCL are already facing a fiscal loss of 14 crores and if the prices are not hiked now, then the burden may cross Rs. 40 crores ..Okay But i’m really wondered whats the need for these companies in spending a huge amount in advertisements?? Whats the need for them to Sponser Cricket matches, sponsoring sports players , spending a huge in television advertisements etc etc ..I agree the expenditure for all these is very trivial when compared to the expected loss of 40 C, but definitely this kind of cost cuttings will have an impact in their profit. i’m wondered unless or otherwise Ganguly hold the IndianOil cup ( tht may be possible only if we played against Nambia, Canada etc ..i stress again it may) people in India dont opt for fueling their vehicles ..dont it look somewhat unnecessary one ?? * People then talking about cutting percentage of Excise duty so that the price hike may be reduced ….Someone from TamilNadu also suggest for drop in Sales Tax so that the hike may be reduced…But i ‘m not sure why the ruling parties doesnt show much interest on this …I’m sure it will not less the burden of the govt and it is not a good soln for administration but what i thought is, for our previous mistakes we cant find immediate remedies and its not good to put the entire burden over the people particularly middle class people who is definitely going to be severely blasted with such inconsistent hikes …So lets revolutionize slowly. Also, if i have a thought like only becaz of forthcoming elections LPG and Kerosene prices are not raised, is there anything wrong in it ?? ?..Who is going to bare this burden for ur vote politics ?? * I’m sure it is the world’s most critical pblm of the day ..Whats the alternative for Petrol and Diesel ?? ..But how far we are working towards it ?? r we really invest for such research activities ??. or as usual we are waiting for some other developed country to come up with a proposal and make a big gain out of it ?? Next Next post: Will swift diesel match its petrol version?